Well, it’s been a very long time since I’ve blogged anything and as the magnet I recently purchased says “If not now, then when?” So here I go. Where things stand right now. I’m working full time on an overnight schedule. I had surgery in June with regards to my Crohn’s and Colitis. (I’ll write more about that under my Crohn’s label later) For the first time in a very long time I’m not in any physical pain and I can eat without hurting. And, I don’t have to worry about leaving the house without knowing the location of every restroom within a 5 mile radius of where I’m going. That, in and of itself, has given me back a level of freedom that I had lost. In the meantime I’ve been working on cleaning out my home. And I mean cleaning it out. I’m reading “The Life-Changing Magic of Tidying Up” by Marie Kondo and it has really made a difference in how I look at things. I will admit I haven’t followed it from step one because I had to jump ahead to make room for some things I needed immediately (like a new desk so I Konmari’d my desk) I really recommend this book for anyone who wants to get rid of clutter. I’ve read a lot on how to deal with it and this is the first time something has really hit home. Anyway, for an instant progress report, I’ve started working on the Leisure Arts “63 Easy-To-Crochet Pattern Stitches” afghan. I’ve realized that when I make something (anything) I usually end up giving it away. I’ve kept a few dish cloths and a scarf. I have no quilts, no afghans, nothing of real substance for myself so I decided to make this one for me. 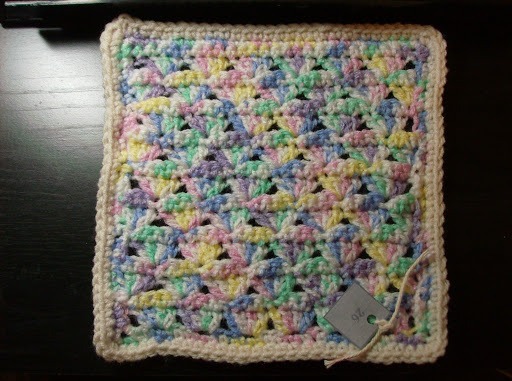 The pattern uses three colors, for some reason I chose four. I’m using Red Heart Comfort yarn in Bambi, Lavender, Mint and Off White. You’ll notice I’m not necessarily doing them in numeric order. 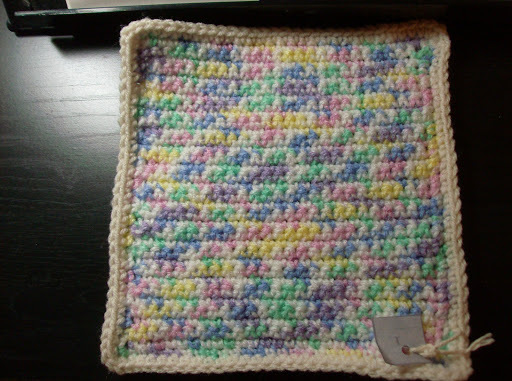 I started with square one because it helped me work out the gauge. Then I started with the first square in the Bambi print, which is 26 on the layout. I’ll work on them in between items I’m making for my Etsy shop. MY ETSY SHOP. MY ETSY SHOP. MY ETSY SHOP. I have to keep saying that to myself. I have actually had a logo designed (you can see it in the banner) and I’m moving forward. Because if not now, then when? Hopefully you’ll follow along on my roaming through the creative peaks and valleys of my mind. Lots of things stuck in there that need to see the light of day. Next Post Already halfway through the month!